The Building Operations department at the University of British Columbia (UBC) has been awarded its second consecutive Platinum rating from E3 Fleet in 2017. UBC Building Operations operates over 220 vehicles and specialty motorized equipment in carrying out facilities maintenance, operations, and renovation services for the lands and buildings owned by the University of British Columbia. 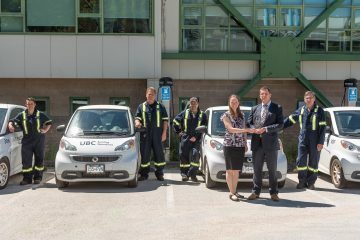 Since being awarded its first Platinum rating in 2014, UBC Building Operations cut greenhouse gas emissions in the fleet by 110 tonnes, representing a 47% reduction from 2007 levels. Trained staff on fuel management and fuel-efficient driving practices. Carbon offsetting for remaining fleet emissions as part of UBC’s central offsets program. You can read more about fleet management services offered across UBC.